Dylan Westfall, of Hermiston, delivers a speech shortly before state officer elections Monday during the 2018 Oregon FFA State Convention in Redmond. The 2018-19 Oregon FFA state officer team assembles for the final gavel of the state convention, held in Redmond in March 2018. From left are Andrew Gmirkin, president; Dylan Westfall, of Hermiston, vice president; Devin Thacker, secretary; Mackenzie Price, treasurer; Sundee Speelman, reporter; and Holly Silvey, sentinel. 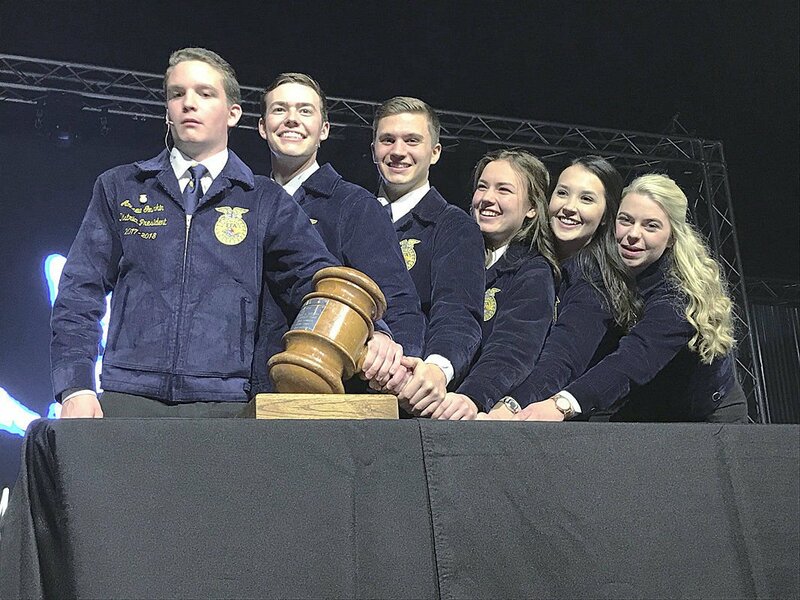 The newest members of the Oregon FFA state officer team realized, shortly after their election Monday, that each of them had one simple thing in common when deciding to run for a position of leadership. They were inspired by a key figure along the way. Take Andrew Gmirkin, who was chosen by delegates as the 2018-19 Oregon FFA state president. Gmirkin, of Eagle Point, does not come from a traditional agricultural background — his mom is a librarian, and his dad makes jewelry. 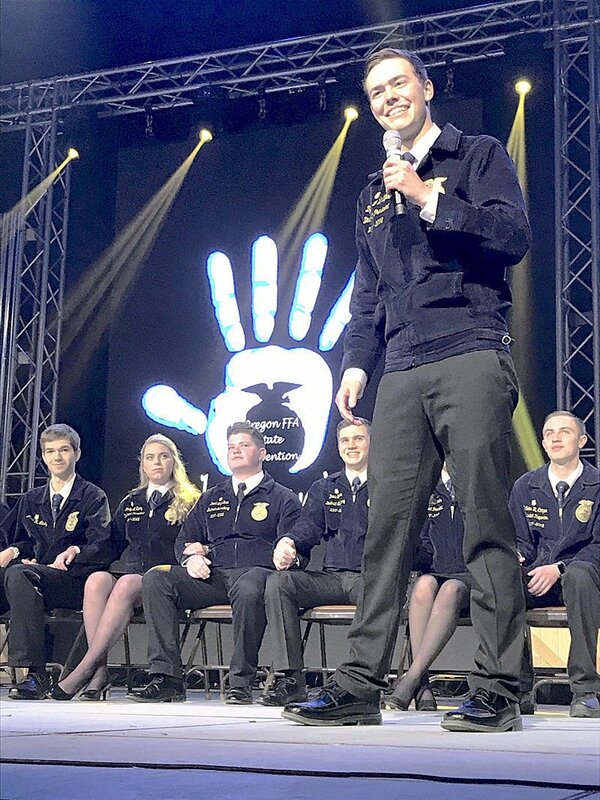 He initially felt out of place joining FFA, until one of his chapter officers assured him that it does not matter whether he was raised on a farm or ranch. Or there’s Mackenzie Price, of Sutherlin, who was elected state treasurer. As a freshman in high school, Price said she struggled with feelings of self-worth. It wasn’t until she attended a leadership camp that others helped her to realize her potential. “I didn’t understand everything I was capable of,” Price said. Together, the group made a commitment to be the same kind of people who help their peers feel confident to achieve their goals. Devin Thacker, the newly elected State FFA secretary from Canby, said a big part of it is to just be yourself. “That is honestly the best advice I’ve ever gotten,” Thacker said. Elections took place Monday morning during the delegate business session, kicking off the final day of the 2018 Oregon FFA state convention held at the Deschutes Fair & Expo Center in Redmond, Ore. Nearly 1,500 FFA members — or “blue jackets,” as they call themselves — from 102 local chapters attended the convention to compete in career development events, attend workshops and network with colleagues. In addition to Gmirkin, Price and Thacker, the state officer team includes Dylan Westfall, of Hermiston, as vice president; Sundee Speelman, of Adrian, as reporter; and Holly Silvey, of Bend, as sentinel. They will spend much of the next year, post-graduation, teaching and hosting workshops at schools across the state. Kourtney Lehman, who served as Oregon FFA president last year, said the experience gave her the independence and leadership skills necessary for college, while also shaping her perspectives on life. Lehman, of Baker City, plans to attend Oregon State University in the fall and will major in agricultural business management with a minor in either marketing or communications. The state convention, March 23-26, featured a full schedule of events and competitions as students aimed to represent themselves and their schools at the National FFA Convention & Expo this fall in Indianapolis. FFA offers career development in areas such as job interviews, agricultural issues and parliamentary procedure, designed to enhance students’ critical thinking, speaking and presentation. Several workshops also introduced the kids to future opportunities in the working world. The OSU Teach Ag Club hosted “Day in the Life of an Ag Teacher,” while the Oregon Department of Agriculture and USDA Natural Resources Conservation Service ran down careers available in their agencies to assist farmers and ranchers. But the convention wasn’t all serious business. It afforded members plenty of opportunities to cut loose, dance and laugh with their friends. The final session almost had the feel of a rock concert, as state officers charged onto the stage beneath a tunnel of outstretched arms, music pumping and lights flashing. The closing address went to Lee Wesenberg, the outgoing state reporter from Sutherlin. He boiled down the keys to success into five main points: personal philosophy, being your own hero, having intellect, conquering your reality and achieving excellence. Spelled out, the acronym is P.H.I.R.E.